This was one of best stays in Ireland. Patricia was a wonderful hostess, breakfast was superb and the location perfect. Would come back in a heartbeat. Beautiful accommodation. Patricia was an extremely gracious hostess, chauffeuring us to the banquet at Bunratty. Lovely modern accommodations. Patricia was very welcoming.It feels like the country but very convenient to Shannon Airport. Very good B & B. We stayed for three nights and really enjoyed it. Very good price and service. Thank you again, Patricia, for your hospitality and kindness. And not to forget Molly, the dog, who welcomed us so friendly. 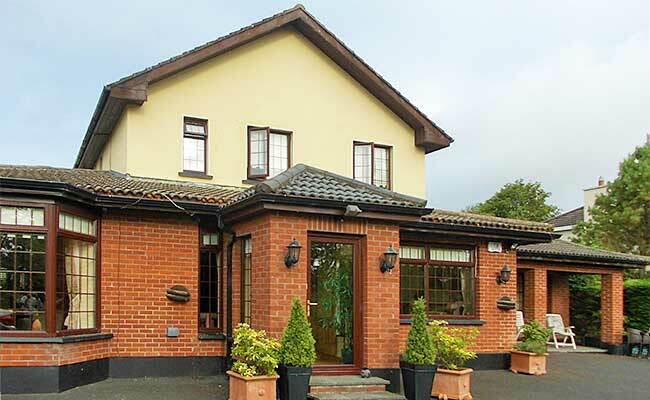 We loved our stay at Bunratty Heights - the room was clean and comfortable, breakfast was great, and Patricia was so helpful and accommodating she even drove us and our luggage to the bus stop in the morning. Would definitely recommend! My husband and I had a delightful, one-night stay at Bunratty Heights B & B before we flew out of Shannon Airport. The owner, Patricia, was so welcoming and accomodating - it was the perfect B & B experience. We both voted our stay at her house as the highlight of our trip and would recommend her establishment to anyone. We enjoyed relaxing in her very comfortable lounge after 12 days on the road in Ireland. The room we had was immaculate, well appointed and the beds were super comfy. I cannot think of a thing that was not top notch. The home is located down a rather private road out of the hussel and bustle of Bunratty and its castle. It is surrounded by lovely gardens and has a large pasture across the street. She cooks made to order breakfasts and the table settings were beautiful. As you can tell, we were so very glad we booked a stay here!! Treat yourself and do the same. A very nice B & B. The room was well furnished and very comfortable. Breakfast was great. Patricia and her daughter made us feel very welcome. Recommended! Enjoyed our stay. Close proximity to Bunratty Castle. Helpful hostess. Sleep disrupted by both headboards hitting the wall when turning over. What an amazing hostess! She went out of her way in so many ways to make our holiday awesome. I especially hold dear how she took special effort to see to my teenage grandson by giving him his own room and snacks for his endless hunger: Molly was a delight, as well. Thank you and we WILL be back! Terrific host and very comfortable and clean rooms. Very close to Bunratty Castle. You also have DurtyNellies. Next to the castle for food and drink. Say hi to Molly your hosts King Charles Spaniel. Close to a major highway and only about an hour's drive to the Rock of Cashel must see also only 15 minutes to Shannon Airport. Excellent breakfast and good parking. Friendly host, very comfortable beds, in quiet location. Highly recommendable. A very nice home just outside of town. Rooms were plush, modern, and comfortable. It was really a good deal for the price. Breakfast was very nice. The owner was kind, but a bit scattered. Arrangements made in advance were forgotten, things discussed on arrival forgotten soon after. Nothing caused a big stir but we had to keep on top of it. Accomodations and staff were very nice. Had to catch a very early flight so was unable to stay for breakfast. Owner was kind enough to provide us with snacks to take with us. Would stay here again and would recommend to others. Lovely home and very welcoming. Our room was very nice, comfortable and clean. I would stay there again. Patricia was very welcoming and a wonderful host! Her house is lovely and our quad room had a nice view of the back garden. Wished we could have stayed longer as Patricia was so nice!!! Her house is just down the road from the Bunratty Castle & Folk Park on a quiet road! I would recommend this B&B to anyone and I will def. stay if I return to Ireland! It was a wonderful place!! Beautiful room, lovely view, great breakfast, close to everything, and our hostess was lovely. Wish we could have stayed another night. I'll definitely stay there again. Highly recommend this place!! Very nice hostess, clean chic rooms and delicious breakfasts. Really a beautiful comfortable b and b in beautiful countryside. It was perfert for our plans! Great place!! We stayed at Bunratty Heights B&B an early arrival from the airport on Oct. 2nd 2012. Mrs. Darcy was very pleasant and the room was extremely clean, comfortable and lovely. The beds were very comfortable and the breakfast the next morning was delicious. Our only regret was that we hadn't booked it for our return to the area in 9 days! The next visit to Ireland will have us staying here the first day AND the last day of our trip. It is close to the airport, extremely close to Bunratty Castle, Durty Nelly's and shopping! Thank you Mrs. Darcy! Great b and b!!! Very beautiful, comfy and the tennant is really helpful. We enjoyed our stay and would book here again. Located near Bunratty Castle & Dirty Nellies & Mac's Pubs. Also close to Shannon Air Port. Sorry that we could not stay longer. We thoroughly enjoyed our stay at Bunratty Heights. Patricia Darcy is a wonderfujl hostess, and we recommend her place to any traveller.